During this busy season of the year, I need to keep my meals super simple, or I will most definitely fall for unhealthy packaged convenience! One of the easiest, yummiest, fastest lunches I can put together is this Unwich Salad, which has all the flavor of a good sandwich, but without the carbs. Cello Parmesan Whisps are a game-changer for me. They made out of 100% Parmesan cheese, but they are crunchy like croutons and so flavorful! Since they’re quite high in protein, I often eat them plain as a substitute for crackers and chips, but they’re amazing in Trim Healthy Mama-friendly S salads, too! You could easily turn this salad into an FP by replacing the salami whips with leaner chicken breast or very lean deli ham, cutting back on the Parmesan Whisps, and adding your favorite non-statchy veggies: chopped cucumber slices, a small amount of grated carrots, or finely chopped sweet peppers, for example. The dressing contains a tablespoon of both mayo and half & half, but since you’ll have enough of it to serve 4, you’re still well within the 5 gram fat limit for Fuel Pull meals. One of the easiest, yummiest, fastest lunches I can put together is this Unwich Salad, which has all the flavor of a good sandwich, but without the carbs. A THM S.
Arrange prepared romaine on 4 plates. Top with salami whip pieces and Parmesan Whisps. Whisk together dressing ingredients in a small bowl and drizzle over top of each salad. Enjoy immediately. 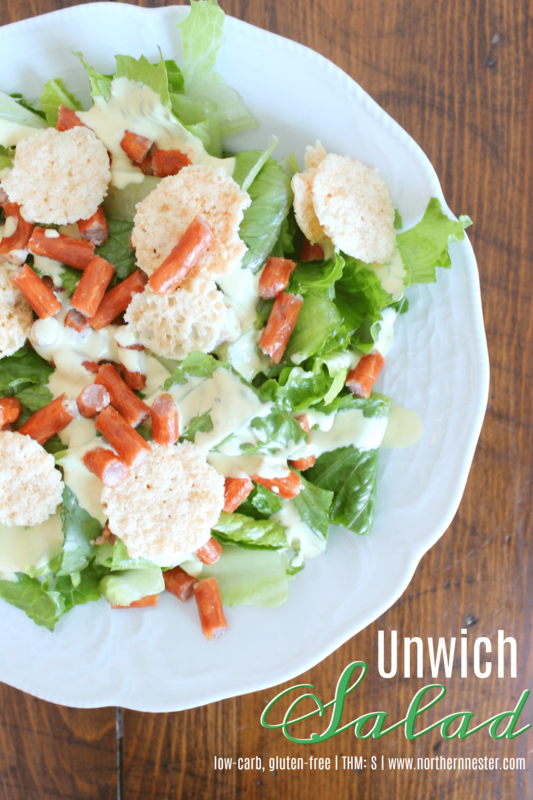 Feel free to load up this salad with a pile of other favorite non-starchy vegetables!